Ghugni always brings out a lot of memories, when in school it was my daily treat. The Ghugni wala used to come with a large deep bottomed pan/Dekchi full with this yellow heaven every day in our school. The other kinds of stuff what he kept along with Ghugni was a bunch of Shalpata, disposable spoons, a spcl. masala jar, a pot full of tamarind water and a plate of chopped green chillies & onions. When the bell rang for tiffin time we hurriedly rush to him for our regular portion of Ghugni. He used to sit on the school floor, and a well-knitted crowd gathered every day around him. The price was 50 paise for a half plate and 1 rupee for a full plate of Ghugni. And he would leave with an empty pan daily, that too got empty within 15 minutes only. 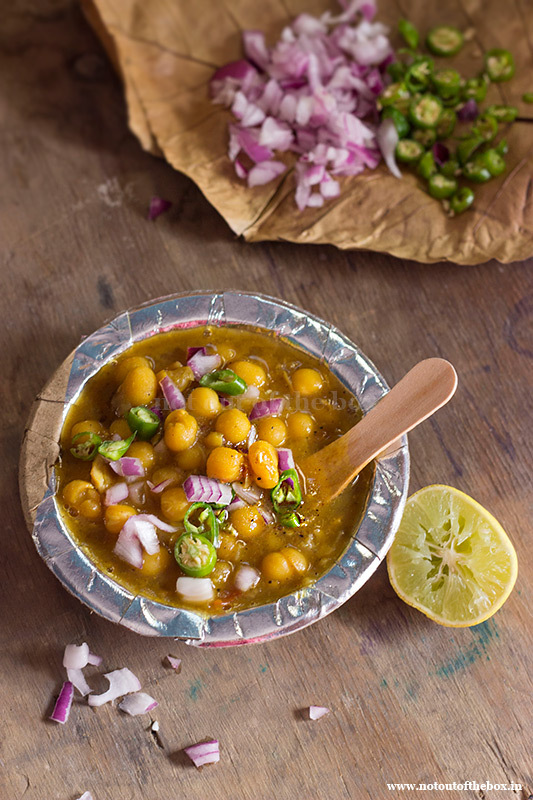 The balancing act of having Ghugni from a single piece of Shalpata with a squarish spoon made from the Shalpata itself was a challenge that too equally enjoyed along with the food. Those were the golden days. Nevertheless to say it’s one of the most desired street foods of Kolkata & Bengal. During the Durga Puja days, one can find at least one Ghugni stall among many other food stalls at Puja Pandals. And that’s a tradition, without this food hoping is incomplete. Back home, my Mom used to cook this pretty often and it was a staple then. I’ve learned this from her. 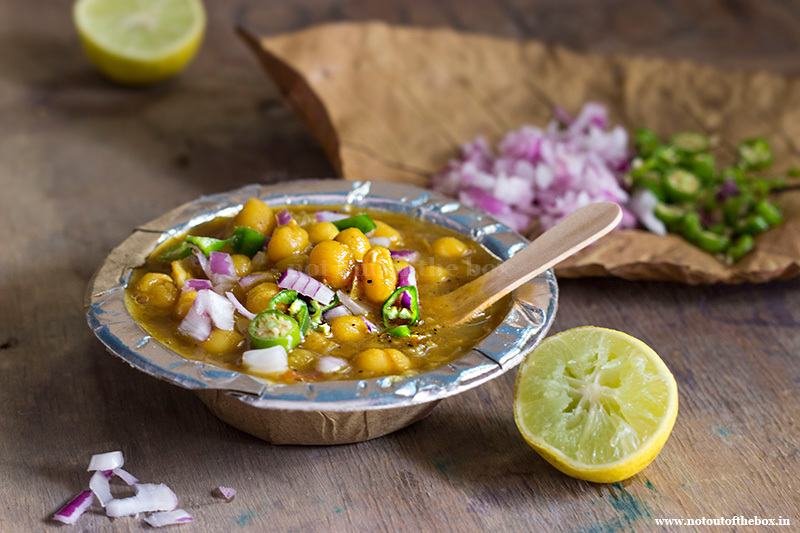 Ghugni can be served with luchi, paratha, roti or of course, enjoy devouring on its own at any time. 🙂 As it’s a popular food, the recipe varies a little bit from home to home. I’m sharing my version here. 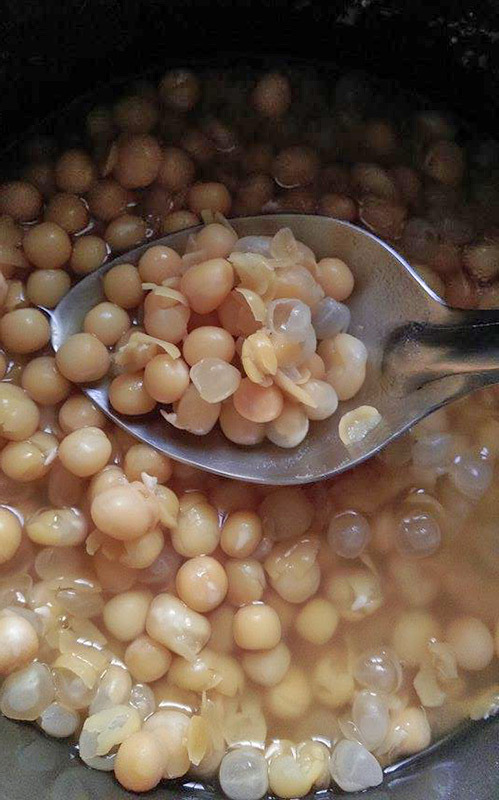 Soak Ghugni motor/yellow dried peas in a generous amount of water for 5-6 hours. Now add soaked yellow peas in a cooker. Pressure cook with enough water (water level should be 2″ high from the yellow peas). Check after 4-5 whistles. You need to cook the yellow peas with grains visible mostly and little mushy at the same time. So, adjust the whistles accordingly. Open the lid after pressure has reduced. 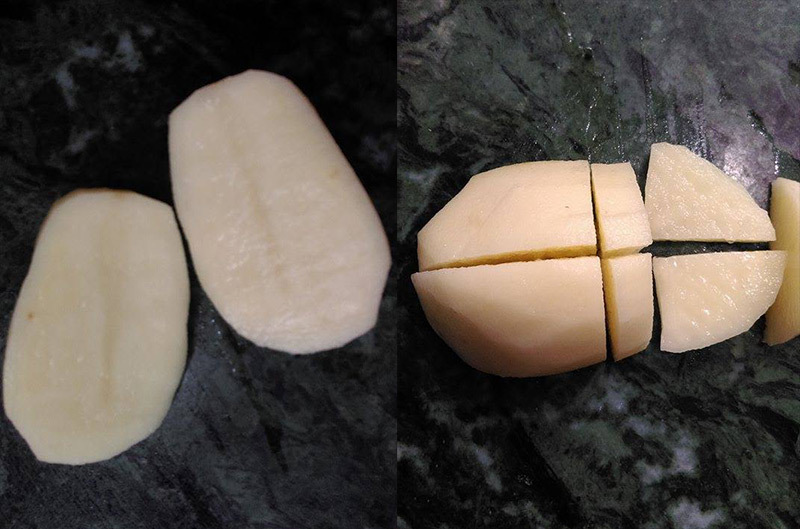 Peel the potatoes and cut lengthwise. Then cut each half lengthwise again, and cut the wedges into cubes. Wash well and keep aside. Heat oil in a deep frying pan/kadai. Add cubed potatoes, fry over medium heat until golden in color. Remove and keep aside. Now add the ingredients mentioned ‘for tempering’, sauté for a few seconds. Add sliced onions, fry over medium heat until light brown in color. Next to add garlic paste, mix and sauté for few seconds. Add chopped tomatoes, ginger paste, turmeric powder, cumin powder, and salt. Mix and fry over medium heat until the masala starts leaving oil. Add boiled yellow peas, potatoes and green chilies into this. Mix well and cook for 10 minutes over medium heat. Keep stirring in between to prevent burning from the bottom of the pan. Now add ¾ cup of water into this. Mix well and cook over low heat until the potatoes are done. Keep stirring in between. Check salt, add sugar, black pepper powder, garam masala powder. Mix well and cook for 2 minutes more. Remove from heat. Serve hot. While serving garnish with chopped green chilies & onion, followed by a generous drizzle of lemon juice or tamarind water on top. Enjoy! The street vendors in Kolkata don’t use black pepper powder in Ghugni, they use red chili powder. This is my personalized addition to Ghugni, as I avoid red chili powder for health issues. If you’re using red chili powder add it while adding other spices with tomatoes, as I’ve mentioned in the recipe. Drizzle tamarind water on top for the authentic street like taste. The consistency of Ghugni should be moderately thick, so, adjust water accordingly while cooking. My Mom used to add small & thin fried coconut chips into Ghugni. Check this post to know how. Ghugni is a popular street food of Kolkata and Bengal. 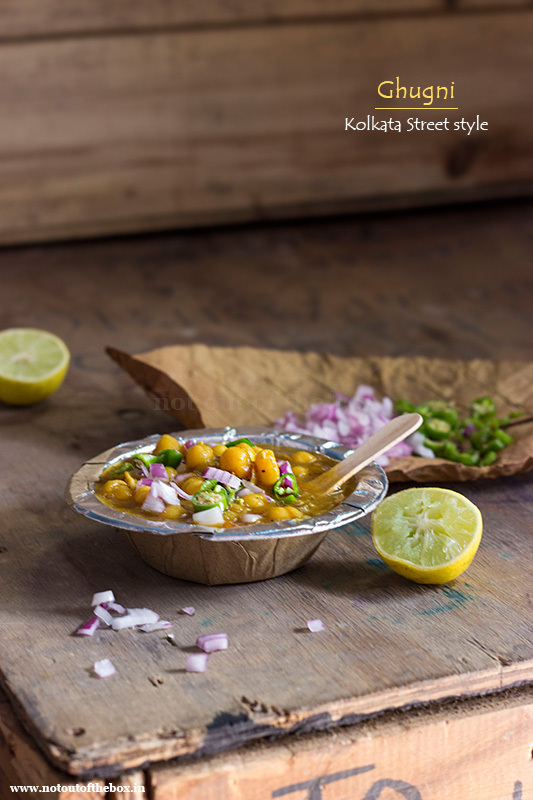 Made with dried yellow peas, potatoes, and other spices this curried snack is a favourite of many. The street vendors in Kolkata don’t use black pepper powder in Ghugni, they use red chili powder. This is my personalized addition to Ghugni, as I avoid red chili powder for health issues. If you're using red chili powder add it while adding other spices with tomatoes, as I’ve mentioned in the recipe.